Setting up branches requires you to select a branch main number from your pool of virtual numbers, define a branch receptionist, and point the virtual number to the branch receptionist. If the receptionist of a branch is a live attendant, gather the extension number. If the receptionist of a branch is an auto attendant, define an auto attendant. If the receptionist of a branch is a ring group or a call queue, define the desired ring group or call queue. Determine a virtual number for each branch. Determine the number of extensions for each branch. 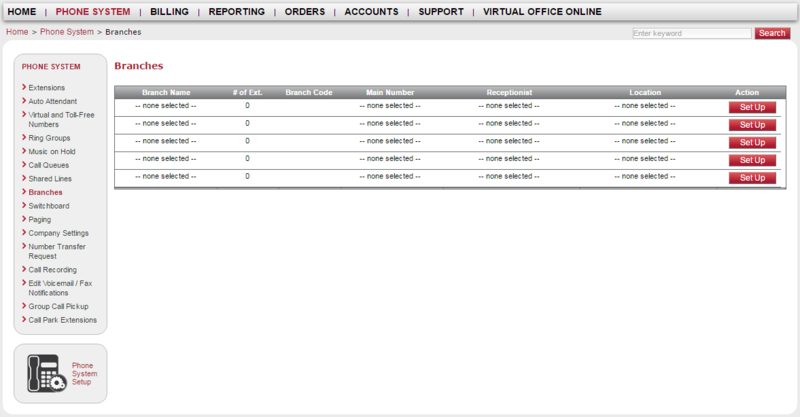 Create your call queue, ring group, or auto attendant as desired. Select a virtual number for each branch. Specify a receptionist for the branch; if a call reaches voicemail, the caller can either leave a voicemail or dial <0#> to reach the branch receptionist. Add extensions to the branch. Point the branch virtual number to the branch receptionist. Segment the auto attendant options (dial by name, extension, or (Undefined variable: LocalVariables.CompanyDirectory)) to streamline searching if a branch virtual number points to an auto attendant. Under the Phone System menu, click Branches. A set of branches is waiting to be configured. Select a branch and click Set up to begin defining a branch. This language is set as your branch default language. Telephony IVR messages, such as voicemail greetings, are played in this language. You can also set the language at the PBX level. Note: The PBX or branch language does not affect the agent's desk phone display. You must select the language of preference for the individual extension user. For details, refer to Edit Individual Extensions. Select Main Number for the branch by choosing a virtual number. Note: The destination for the virtual number is your receptionist. Note: The Address field is for reference purposes, and does not have any impact on the functionality. Select a Receptionist based on the type. If the receptionist type is Extension, select an extension from the available list. Note: The branch administrator appears under the view-only Admin list. You can determine the secondary administrator for a particular PBX under Accounts > Privileges > PBX. Enter a Branch Code. A branch code must be unique within the same PBX, but can be used in a different PBX. Enter an Extension Length. This is the combined length of the branch code and short code. This is specific to the branch only. The short code will now transform to a fully-qualified extension, which includes the branch code and the short code. For example, if you assigned branch code 4 to the San Francisco branch office, branch users with short codes (such as 1001) will be assigned with a fully-qualified extension number (such as 41001). Note: Branch Code and Extension Length are only applicable to enterprise customers with multiple PBXs and branches. You can assign regular extensions as well as service extensions to a branch. Assigning a service extension is managed in the respective configuration page for ring groups, call queues, and auto attendants. For details, refer to Assigning Service Extensions to a Branch. A list of all extensions within the iPBX is displayed. Select the desired extensions, and click Add. The extensions are now mapped to the branch. Repeat the setup process to define all other branches in your iPBX. The next step is to assign a destination for the branch virtual number. If you already assigned the destination, make sure it matches the receptionist type defined for the branch. 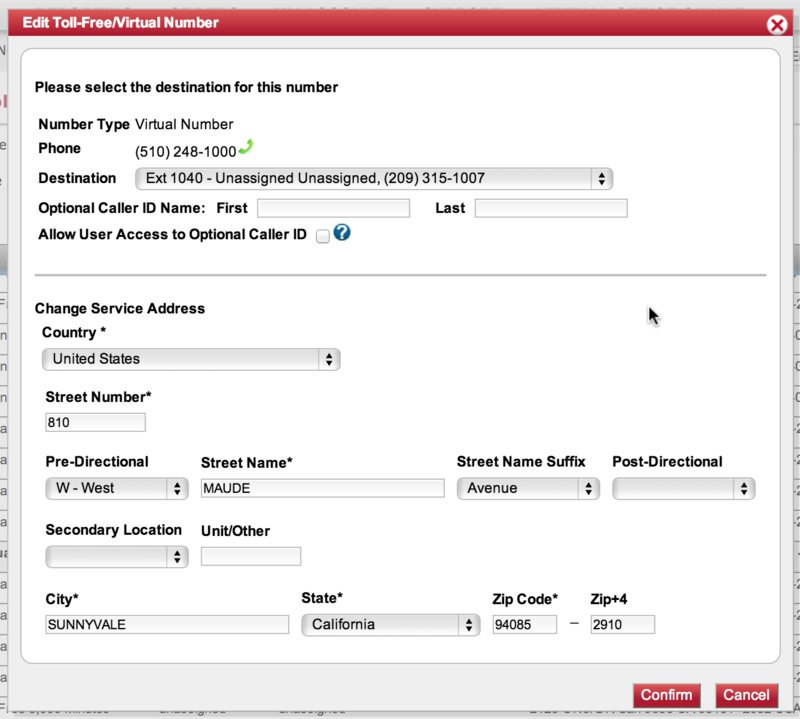 Under the Phone System menu, select Virtual and Toll Free Numbers. Select the virtual number assigned to a branch, and click Edit. 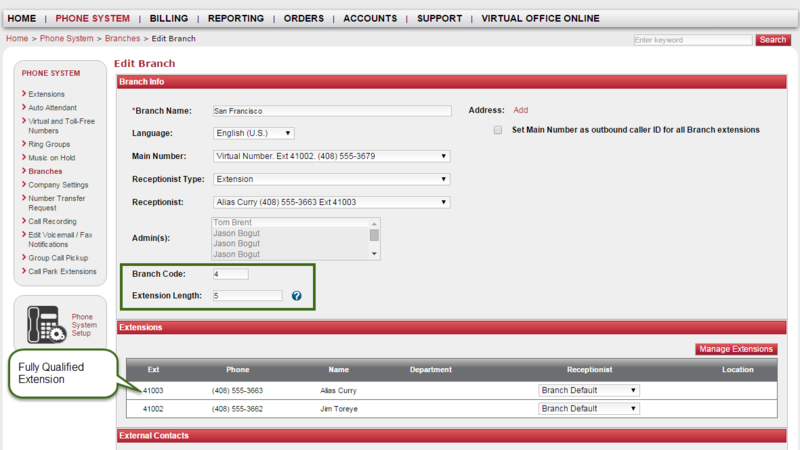 Select the destination to match the receptionist type defined for the branch in Step 3: Assign Extensions to the Branch. Optionally, change Service Address to match the branch address. 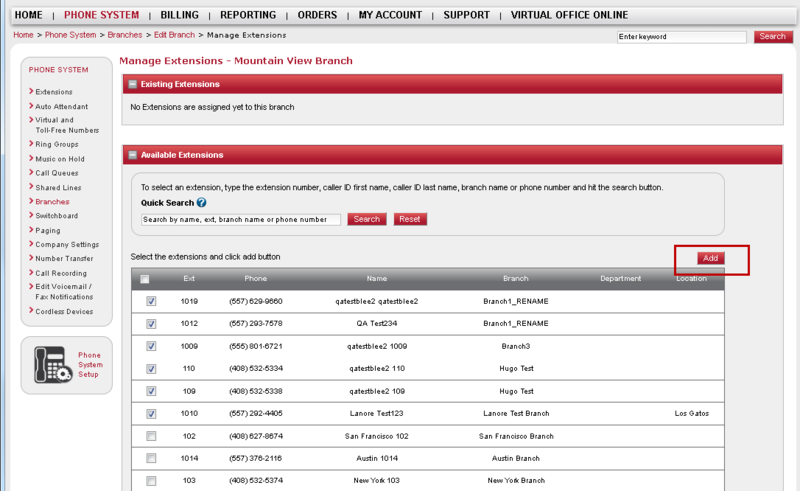 Note: The destination for the branch virtual number must match the receptionist type defined for the branch. You can add or remove regular extensions to a branch and change branch assignment any time. Click Manage Extensions within the branch settings. Add: From the available extensions, select extensions and click Add. Change Branch: Select a branch extension. 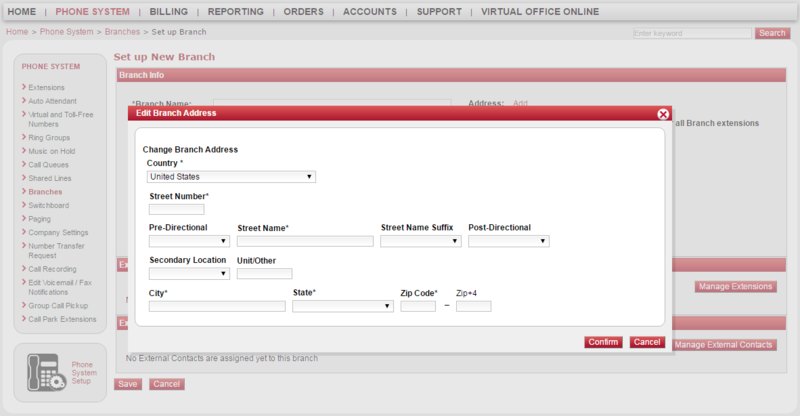 In the Change Branch drop-down, select a desired branch from the available branches. Remove Branch: Click to remove a branch. Note: Adding or removing service extensions should be managed via the respective service extension configuration page.